The Common Read program at UMass Amherst is making an impact that’s bigger than ever—on the Class of 2017, not on the planet. The 2013-2014 selection is No Impact Man, Colin Beavan’s humorous memoir about his family’s attempt to live a year without producing waste (like garbage, toxins, and carbon emissions) or consuming excessively (resources like water, electricity) to achieve a zero-impact lifestyle in New York City. And this year, “UMass Amherst has extended Common Read events through the first nine weeks of the fall semester and has widened its compass to include members of the local community.” The author kicked things off with an appearance at New Student Convocation on September 1; he returned to campus this month to follow up with students and answer their questions in “A Conversation with Colin Beavan,” moderated by Steve Goodwin, Dean of the College of Natural Sciences. 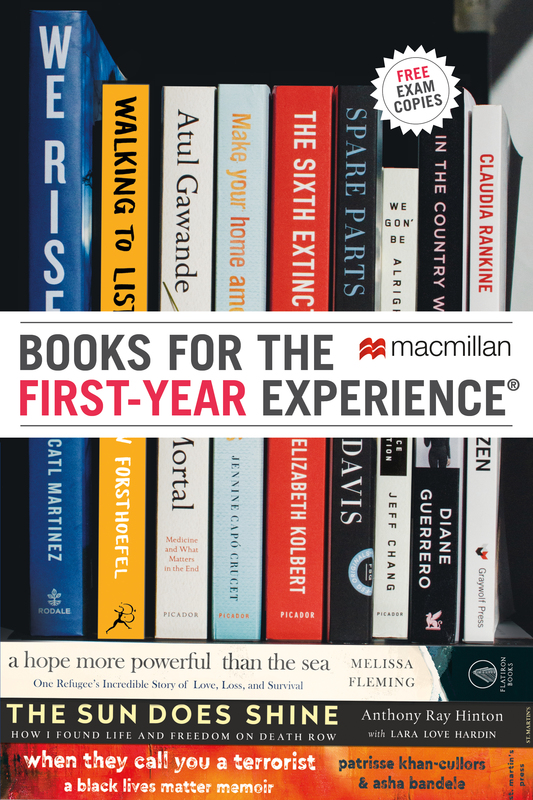 The Common Read offers a shared intellectual experience for all first-year and transfer students. Faculty and administrators created the Read to foster critical thinking and discussion among students, faculty, and staff . . . Discussions will [cover] the values of participatory democracy, the importance of individual action as well as collective action, and the demands and rewards of living with conviction and integrity to one’s own principles. The Common Read hopes to jumpstart the global, adaptive outlook of the Class of 2017 and their sense of living in a shared world. At Summer New Student Orientation, all first-year students received a copy of No Impact Man, customized with the logo for the university’s college transition and success program, FYI: First-Year Intelligence. The program aims to broaden students’ intellectual horizons; help them build relationships with other students, faculty, and staff; and provides academic and personal support throughout their college transition. Though the Common Read is intended primarily for new students, the themes in this year’s book are relevant to the university as a whole and have applications across campus. 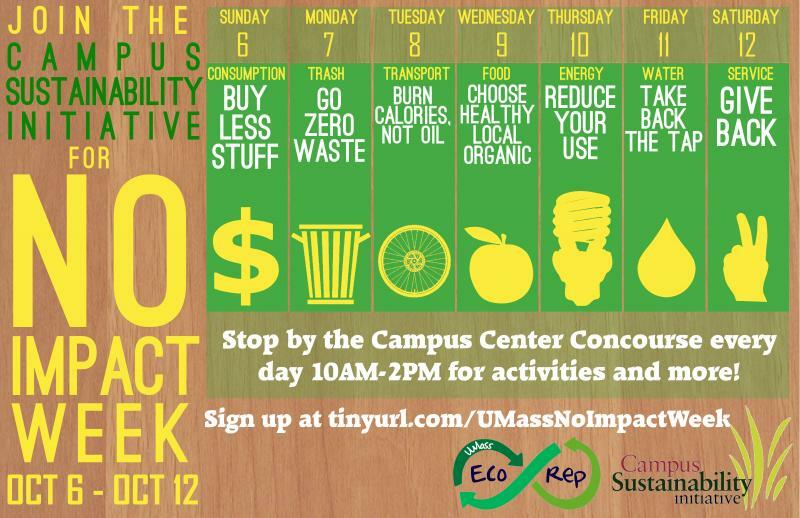 Members of the community spent the first two months of the semester raising awareness about conservation and consumption, making changes to campus operations, and running a university-wide No Impact Experiment, October 6-12. Faculty-lead book discussions were held over dinner in every first-year residential cluster, and the documentary film about Colin’s experience was screened in every first-year residence hall. The Office of Residential Life also promoted resources for Living Sustainably at UMass, like the Student Government Association’s campus bike share and a model sustainable dorm room. Many of these programs will remain fixtures on campus, representing the university’s commitment to the environment. For instance, the UMass Sustainability Initiative monitors energy consumption on campus with the Energy Dashboard and UMass Dining serves “local, sustainably-grown, humanely-raised, and fair trade foods,” including some produce and herbs grown in permaculture gardens right on campus. The innovative Permaculture Initiative was recognized by the White House in 2012! Nearly thirty colleges and universities have adopted No Impact Man for common reading programs, and many have conducted their own No Impact Experiments, as well—read about them here!